Decadent Steak Oscar is what you make when you can't decide between a perfectly cooked piece of meat or a delicate cluster of buttery seafood. It's the ultimate surf and turf dish perfect for a special occasion or date night dinner. Though typically served with a Bearnaise Sauce, I prefer it without. Place the butter, parsley, lemon juice, 1/2 teaspoon of the salt, and 1/4 teaspoon of the pepper, in a medium bowl and stir until combined. Set the butter aside while you cook the steaks. Heat a large cast-iron skillet over medium-high heat. Rub both sides of the steaks with the olive oil, and season with the remaining salt & pepper. Place the steaks in the hot skillet and cook approximately 4 minutes on each side, or until nicely browned. Transfer the skillet to the oven and roast until, 6 to 8 minutes for medium-rare (depending on the thickness of the steak and whether your steak is bone-in or boneless). An instant-read thermometer inserted into the thickest part of the meat should register 130°F for medium-rare, 140°F for medium. While the steaks are cooking, toss the asparagus with a tablespoon of olive oil and place on a large baking sheet. Season with salt and pepper, and roast until asparagus are crisp-tender and lightly golden, 8 to 10 minutes. In the meantime heat another skillet over medium-high heat and add 2 to 3 tablespoons of the butter mixture. Add the crab-meat and cook, until the crab-meat is warmed through. 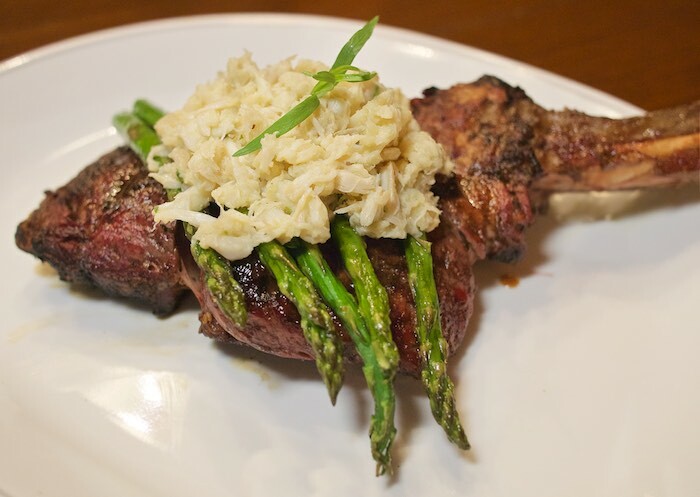 When ready to serve, top each steak with several spears of the asparagus and place the crab-meat on top of the steaks.